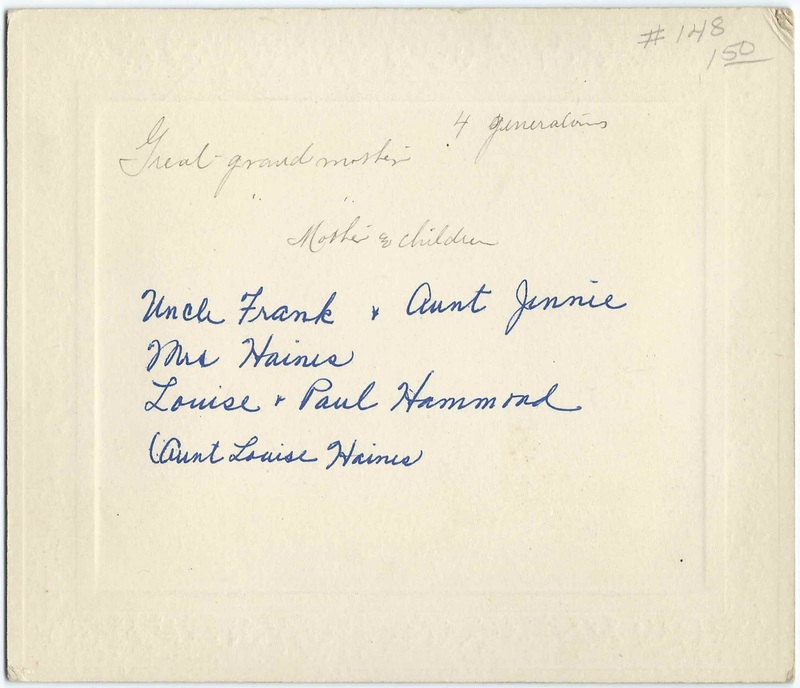 Four generation photograph: The surname is shown as Haines, but most records shows this family as Haynes. Although the location wasn't given, the names provided enough clues to the family's identity. Mary Jane (Hoyt) Haynes was born September 8, 1834 at Freeport, Maine, the daughter of Winthrop William Hoyt and Jane (Sawin) Hoyt. 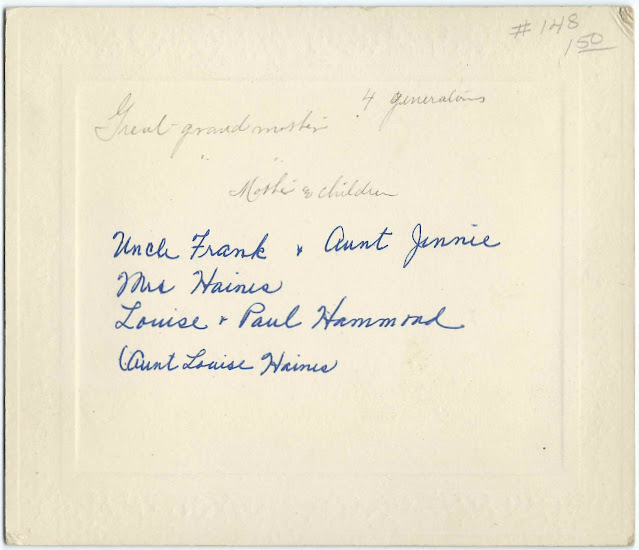 On June 25, 1851 at Waterford, Maine, or at Greenland, New Hampshire, Mary Jane married William Mansfield Haynes or Haines, son of Samuel Haines and Eliza (Mansfield) Haines. William was born Greenland, New Hampshire on January 26, 1824. He served in the Civil War. William and Mary Jane farmed at Waterford, Maine, and had at least four children, one of whom was Jennie Louise Haynes, who married Frank Sproule Hammond, son of Thomas Hammond and Mary J. (Workman) Hammond. Jennie and Frank had, I believe, three children, one of whom, William Francis Hammond, had died by the time this photograph was taken. The other two, both shown in the photograph, were Mary Louise Hammond and Paul Haynes Hammond. 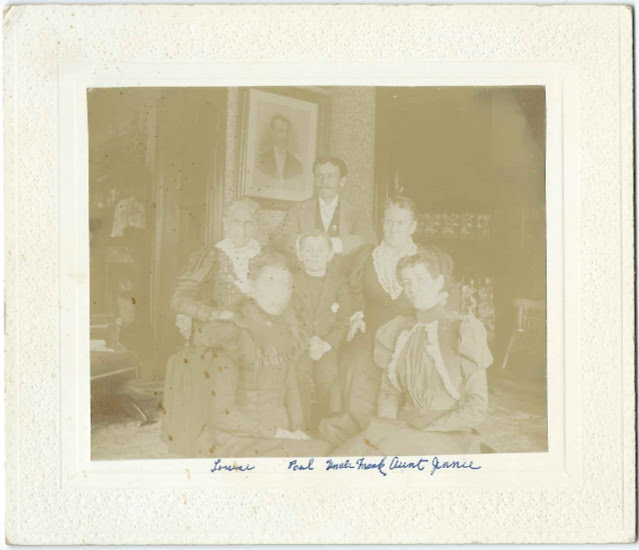 By 1900, presumably around the time the photograph was taken, Mary Jane (Hoyt) Haynes was living at Malden, Massachusetts with daughter Jennie Louise (Haynes) Hammond and her family. Mary Jane's husband William Mansfield Haynes had died in 1893; Mary Jane died in 1908. They're buried in the Elm Vale Cemetery at Waterford, Maine. The other person in the photograph is Aunt Louise Haines, who may have been a sister-in law, daughter, daughter-in-law or other relative of Mary Jane (Hoyt) Haynes and William Mansfield Haynes. If you have corrections, additions and/or clarifications to the information above, please leave a comment or contact me directly.